The night John Fernandez Raspado won the title of Mr. Gay World 2017, the Filipino entrepreneur and HIV activist began the competition wearing an eye-catching cultural costume with a headband, breast piece, armlets and loincloth made of vivid yellow, red and black beads. For the swimwear portion he showed off his ripped physique in a white Speedo covered in bright red lips. And during formal wear, John Raspado appeared in a dashing, form-fitting black tuxedo, his lapels and back covered in dazzling black sequins. But despite his show-stopping appearance, Raspado’s handsomeness, his taste in swimsuits, costumes and formal wear alone didn’t win him the title. That’s because Mr. Gay World isn’t merely a beauty pageant. 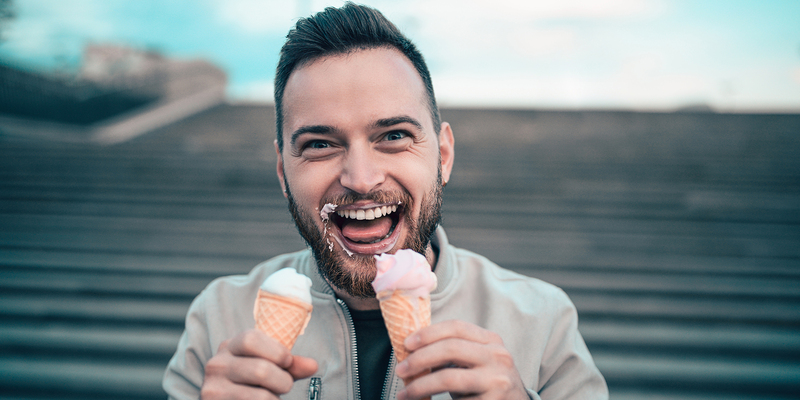 The competition scored Raspado and 20 other competitors from five continents in 11 categories including a sports challenge, a written test, a personal interview and a social responsibility campaign. Before he made history as the first Filipino and Southeast Asian man to win the Mr. Gay World 2017 title, John Raspado helped raise awareness about HIV testing and prevention among gay, bi and trans men through the Love Yourself Project. But since being crowned as the ninth Mr. Gay World, Raspado has used the international platform to serve as a gay ambassador, advancing LGBTQ human rights locally and throughout the world. After winning the title, Raspado served as an ambassador and special guest at several Pride events, including the Metro Manila Pride March in June, Kaohsiung Pride in Taiwan last November and the Filipino Quezon City Pride in December. He also served as an ambassador for Hong Kong’s bid to become the first-ever Asian city to host the Gay Games. Hong Kong won that bid and is gearing up to host the 11th Gay Games in 2022. 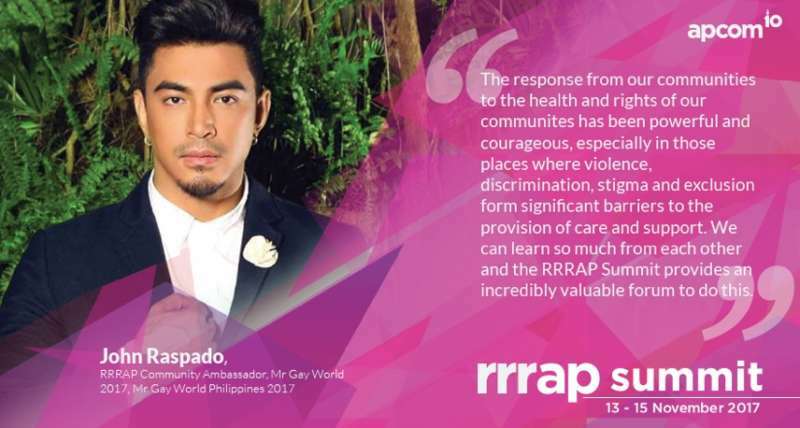 Raspado also made multiple TV appearances and spoke at the 2017 RRRAP Summit held by the Asia Pacific Coalition on Male Sexual Health, an annual conference during which over 300 HIV and community health and rights advocates from across Asia and the Pacific met to discuss their strategic approaches to communities most affected. 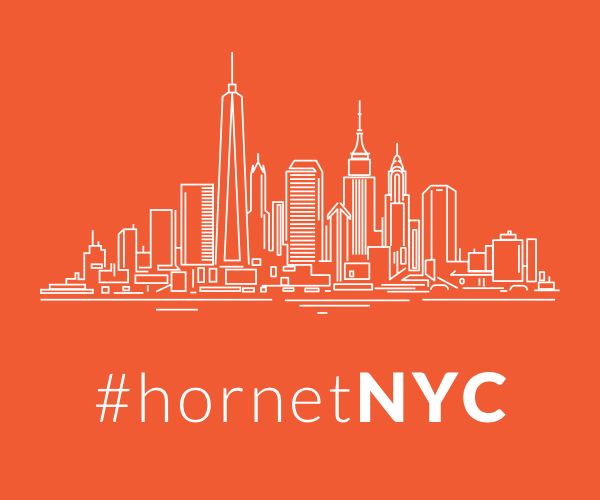 At the conference he spoke about how social and sexual capital can help community-based organizations, and how racism, HIV stigma, sexism and body image affect the gay dating experience on mobile apps. John Raspado was also an ambassador for the Asia Pacific Coalition on Male Sexual Health (APCOM) 2017 Rights, Resources and Resilience: Asia Pacific Summit (the RRRAP Summit). The H stands for healthy living in mind, body and spirit; the E for equality; A for acceptance; R for responsible HIV awareness; and T for the testing and treatment of HIV. But beyond emphasizing the need for love, respect and sexual health in the queer community, Raspado says the #IHeartLGBTQI campaign is mostly about empowerment. “Once they have understood and changed for the better, we can advance to other relevant issues like equality, diversity and inclusion, HIV and AIDS,” he says. Although Raspado has enjoyed his time spent as Mr. Gay World, his reign will conclude in May 2018 as Mr. Gay World crowns its 10th international titleholder in Knysna, South Africa. “I wish the new Mr. Gay World good luck throughout his journey,” he says. What do you think of the work of John Raspado, Mr. Gay World 2017? Sound off in the comments.